We’d love your help. Let us know what’s wrong with this preview of Crucial Confrontations by Kerry Patterson. The authors of the New York Times bestseller Crucial Conversations show you how to achieve personal, team, and organizational success by healing broken promises, resolving violated expectations, and influencing good behavior. Discover skills to resolve touchy, controversial, and complex issues at work and at home--now available in this follow-up to the internationally popul The authors of the New York Times bestseller Crucial Conversations show you how to achieve personal, team, and organizational success by healing broken promises, resolving violated expectations, and influencing good behavior. Discover skills to resolve touchy, controversial, and complex issues at work and at home--now available in this follow-up to the internationally popular Crucial Conversations. Behind the problems that routinely plague organizations and families, you'll find individuals who are either unwilling or unable to deal with failed promises. Others have broken rules, missed deadlines, failed to live up to commitments, or just plain behaved badly--and nobody steps up to the issue. Or they do, but do a lousy job and create a whole new set of problems. Accountability suffers and new problems spring up. New research demonstrates that these disappointments aren't just irritating, they're costly--sapping organizational performance by twenty to fifty percent and accounting for up to ninety percent of divorces. - An employee speaks to you in an insulting tone that crosses the line between sarcasm and insubordination. Now what? - Your boss just committed you to a deadline you know you can't meet--and not-so-subtly hinted he doesn't want to hear complaints about it. - Your son walks through the door sporting colorful new body art that raises your blood pressure by forty points. Speak now, pay later. - An accountant wonders how to step up to a client who is violating the law. Can you spell unemployment? - Family members fret over how to tell granddad that he should no longer drive his car. This is going to get ugly. - A nurse worries about what to say to an abusive physician. She quickly remembers "how things work around here" and decides not to say anything. Everyone knows how to run for cover, or if adequately provoked, step up to these confrontations in a way that causes a real ruckus. That we have down pat. 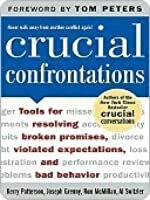 Crucial Confrontations teaches you how to deal with violated expectations in a way that solves the problem at hand, and doesn't harm the relationship--and in fact, even strengthens it. To ask other readers questions about Crucial Confrontations, please sign up. If you want to really help people excel in life - this is a must have book on communication. It really deals with so much more than communication and confrontation. The chapter on motivation has given me so much more understanding on how people are motivated and it gave me some really great tools to help others and myself get unstuck. I also loved this quote on safety "At the foundation of every successful confrontation lies safety. When others feel frightened or nervous or otherwise unsafe, you If you want to really help people excel in life - this is a must have book on communication. It really deals with so much more than communication and confrontation. The chapter on motivation has given me so much more understanding on how people are motivated and it gave me some really great tools to help others and myself get unstuck. I'm not much of a confrontational person because I lose control when emotions and stakes are high. But after reading this book, I really do feel like I could talk to anyone about anything, if I had the time to plan for it. It takes preparation to make a crucial confrontation go well. What I liked from the book is how the authors encourage you to have your crucial confrontations. So often we shy out of them and endure the unpleasant consequences. It's almost always worth it to have them. Another m I'm not much of a confrontational person because I lose control when emotions and stakes are high. But after reading this book, I really do feel like I could talk to anyone about anything, if I had the time to plan for it. It takes preparation to make a crucial confrontation go well. •In the best companies people will hold a crucial confrontation face-to-face and in the moment.This of course takes skill. •We can’t go in determined to fix everyone else and expect to get the results we are really after, we can only really ever change ourselves. •Perhaps the largest mistake we are making is exaggerating the cost of confronting an issue, This stems from the erroneous belief that the existing world always punishes people who are naive enough to speak their minds. •Effective problem solvers observe an infraction and then tell themselves a more complete and accurate story. Instead of asking what’s the matter with that person? They ask why would a reasonable rational and decent person do things like that? In asking this humanising question the individual is able to routinely master crucial confrontations and adapt to any situation. Instead of arguing the others are misbehaving only because of personal characteristics influence conversation Masters look to the environment and ask what other sources of influence are acting on this person? What is causing this person to do that?. •Admitting that problem might stem from several different causes changes our whole approach. We aren't certain, we aren’t smug, we aren't angry and we slowdown, we're curious instead of being boiling mad. We feel the need to gather in all data rather Then charge in guns all blazing. We moved from Judge jury and executioner to curious participant. •When others know that you value them as a person and care about their interests they will give you an amazing amount of leeway. They will let you say almost anything. That’s why your four-year-old granddaughter can tell you that you are fat without offending you. You know that she loves and respects you and that her motives are pure. This after all is an innocent child. However if what you say or how you say it causes others to conclude that you do not respect him or that you have selfish and perverse motives nothing you say will work. •First imagine what others might Mistakenly conclude. Second immediately explain that this is what you DO NOT not mean. Third as a contrasting point explain what you do Very clearly mean. The important part is the do not portion of the statement. Explaining about you do not mean early in the conversation when giving them feedback. Clear-cut and well-organised, but how applicable? This is a often-recommended book: it has everyday scenarios, clear acronyms and a cohesive structure. As a person who grimly goes alea iacta est into confrontations, the book presents numerous elegant options. They are all applicable, accessible to all and obviously better alternatives to "throw it out there and outrun the others until they run out of steam and they are willing to listen". So far, the only issue I have found is that it didn't cram Clear-cut and well-organised, but how applicable? It is a helpful resource for dealing with uncomfortable situations. I have already experienced success in its application. The principles it uses to guide accountability conversations are wholistic and well grounded, rather than a set of gimmicks or tricks to get people to bend to the desired outcome. The process leads to a win-win situation with both parties becoming better people. I didn't know how much I needed this book until I read it for one of my classes. As someone who has had hard time confronting people all her life, this was a precious little tool to learn those little techniques that could be used to have a proper 'accountability conversation' with someone you need to confront. From beginning to quarter end of the book is very hard to understand, perhaps there were a lot of metaphors? however the end part is easily understandable and relate able. “If something comes up, let me know right away.” Then decide together. • What - Ask yourself what you really want. You can talk about the content, the pattern, or the relationship. To stay focused, ask what you really want. • If - Are you talking yourself out of an accountability discussion? Don’t let fear substitute for reason. Think carefully not just about the risks of having the conversation but also about the risks of not having it. Instead of assuming the worst and then acting in ways that confirm your story, stop and tell the rest of the story. Ask: “why would a reasonable person not do what he or she promised?“ “What role might I have played?“ When you see the other person as a human being rather than a villain, you’re ready to begin. Make it safe by starting with the facts and describing the gap between what was expected and what was observed. Tentatively share your story or only after you’ve shared your fax. And with a question to help diagnose. After you’ve paused to diagnose, listen for motivation and ability. Remember you rarely need power. In fact, power puts you at risk. Instead, make it motivating and make it easy. To do that, explore the six sources of influence. Remember to consider the social and structural sources of influence. Agree on a plan and follow up. Remember who does what by win and then follow what this idea is simple and services it’s own reminder. Then asked to make sure you’re not leaving out any details or missing any possible barriers. As other issues come up, don’t meander; consciously choose whether to change the conversation to the new issue. Waive the new infraction. If it’s more serious or time sensitive, deal with it. If it is not, don’t get sidetracked. Subtitled “Tools for Resolving Violated Expectations, Broken Commitments, and Bad Behavior,” this book is the updated version of “Crucial Conversations.” The authors are the leaders of Vitalsmarts, an innovator in best-practices training products and services. After describing exactly what “crucial accountability” is, the authors start in Part One by having the reader look in the mirror, determining what should be addressed personally before any discussion takes place. 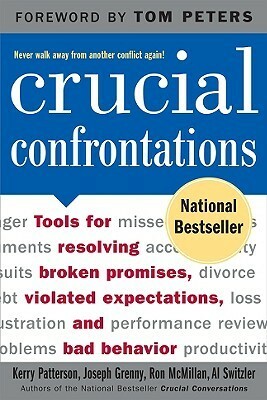 Choosing “what” and “if” f Subtitled “Tools for Resolving Violated Expectations, Broken Commitments, and Bad Behavior,” this book is the updated version of “Crucial Conversations.” The authors are the leaders of Vitalsmarts, an innovator in best-practices training products and services. After describing exactly what “crucial accountability” is, the authors start in Part One by having the reader look in the mirror, determining what should be addressed personally before any discussion takes place. Choosing “what” and “if” focuses on what conversation should take place, if any. They encourage you to “master your story,” being sure that your mind is in the right place before you say a word. In other words don’t assume you know what caused anyone to act the way they did! You’re probably wrong! Part Two focuses on “creating safety,” providing practical advice on how to start an accountability discussion, creating motivation for change, encouraging commitment and staying focused while being flexible in the face of the inevitable “curve balls” that often occur. Part Three, “Move to Action,” speaks to agreeing to a specific plan, following up, dealing with complicated problems, as well as a great chapter on what they call the “Yeah-Buts” (”I already tried that, and it didn’t work!”). This extremely practical book closes with a self-assessment for the readers to measure their skills in holding an accountability discussion, as well as presenting diagnostic questions for the author’s “Six Source Model” to assist in understanding why people do what they do (back to Master the Story). The six sources they suggest are 1) Self, Motivate (Pain and Pleasure), 2) Self, Enable (Strengths and Weaknesses), 3)Others, Motivate (Praise and Pressure), 4)Others, Enable (Helps and Hindrances). 5)Things, Motivate (Carrots and Sticks) and 6)Things, Enable (Bridges and Barriers). The appendix closes with advice on actions to take “When Things Go Right” as well as providing a collection of discussion questions for reading groups. The ideas and tips are good, probably one of the better books on communications. Especially since such scenarios are something that all of us face at work and at home, all the time. But, the writing's style is really convoluted, which makes the book a little hard to read. "From the way adults talk, you'd think peer pressure disappears a few weeks after the senior prom. We constantly warn our chil­dren against the insidious forces wielded by their friends. Yet rarely do we consider the fact that those forces aren't switched off in some mystical ritual when we finish high school..."
Could have been written in a simpler, more straightforward way? The authors tried to include chapter summaries + a key diagram (which helps a little), but since this is a how-to book (rather than a concept book), the devil's in the details, and the details are lost in the pages. Would have given it 5* if not for the writing. Perhaps there are some great ideas there but the book as a whole is poorly written. Unorganized. Good companion to Crucial Conversations, focused specifically on dealing with accountability conversations. Useful read. Good book. Not sure I got as much out of this as I could have. I think I probably should have read Crucial Conversations first. That's on my short list now. My major takeaway from this book was safety. It hasn't really been a consideration of mine but the author goes through great pains to insist that safety be created and maintained for the duration of a confrontation, or else people will retreat to using silence or violence to attempt to make themselves safe. Confrontations happen in one on on Good book. Not sure I got as much out of this as I could have. I think I probably should have read Crucial Conversations first. That's on my short list now. My major takeaway from this book was safety. It hasn't really been a consideration of mine but the author goes through great pains to insist that safety be created and maintained for the duration of a confrontation, or else people will retreat to using silence or violence to attempt to make themselves safe. Confrontations happen in one on one conversations, not in a group environment where safety can't be established. Confrontations should address problems more than feelings in order to maintain the safe environment. All confrontation needs stem from problems, typically of violated expectations, and you have to choose which problem you want to address and which it is strategically wise to address. In business, this may involve work expectations that have been violated. You have to establish, in rapport, what the shortfall is, whether it be motivation or skills, before you can make any meaningful attempts to resolve problems. They also address steps for escalation if needed. Overall, a good read and definitely a resource I'm keeping at hand. The work originates from the authors' desire to capture and study what enables individuals to excel in accountability discussions. I especially enjoyed the chapters on emotional/psychological self-awareness ("Mastering Our Stories") and the down-to-earth techniques for stepping out silence to give voice to accountability failures ("Describing the Gap"). As with Crucial Conversations, I deeply enjoyed the authors' humanist approac Overall, a good read and definitely a resource I'm keeping at hand. The work originates from the authors' desire to capture and study what enables individuals to excel in accountability discussions. I especially enjoyed the chapters on emotional/psychological self-awareness ("Mastering Our Stories") and the down-to-earth techniques for stepping out silence to give voice to accountability failures ("Describing the Gap"). As with Crucial Conversations, I deeply enjoyed the authors' humanist approach and find it especially affirming that they've based their philosophy and techniques off of observations of real people who are highly successful in holding accountability discussions. Really loved the first couple chapters. Although it seemed too many at times having examples of both work and personal issues helped to frame the concepts well. For me it seemed this book lost a little horsepower after the first few chapters. The concept of accountability comes from an authoritarian view rather than one of mutual benefit. I wish a few more chapters could have been written on personal accountability as I think one needs to master this before attempting to hold others accountable. This is a dry book, and could do with better storytelling, but then I guess I am just used to The Anatomy of Peace books being better written. That say there is some good information in this book, and a good approach to how to solve and hold crucial confrontations, just not in an easy to digest format, and I would not have normally read or listened to this book except that my hubby was assigned it at work and it's helpful for us to both read it and be able to discuss it. Not sure I will read the This is a dry book, and could do with better storytelling, but then I guess I am just used to The Anatomy of Peace books being better written. I like it. Once in awhile you fell like glossing over a paragraph because you "get" the idea the authors are trying to suggest. But this book is on my "periodic read" lists - like How to Win Friends and Influence People. There are some books that need to be reviewed to see how we are doing in changing our lives for the better - this is one of them. This book is a crucial read for anyone who deals with people, who has ever had a conflict with another person, or who has ever had someone treat them badly. This was a mandatory read for us as Instructional Coaches, and it was one of the most worthwhile professional reads I've done in a long time. If you discuss the same problem over and over, it's likely there's a more important problem you need to address. Unbundle the problem - what is bothering you most. What story are you telling yourself about the person/issue? Are you going to silence or violence? Broken promises - the game between expectation and reality. My boss recommended this book to me and having finally finished reading it I can see why. I'm totally the type of person who can benefit from this book as I really do dislike having 'accountability' conversations, I'd rather do extra work (and gripe about that) than flag that someone hasn't done as expected. Hopefully I can learn from this book and improve these skills! Really very good. I've heard rave reviews about the book both from my pastor and in the business setting, so perhaps I was thinking there was some incredible new thing I would learn. I think that I probably new and tried to practice a good 75% of this already. The goodness of the book is in the deliberate thought process that will lead me effective crucial confrontations 95% of the time. It's critical to have those crucial conversations and ensure that people take accountability for things. Avoiding / delaying the critical conversations and allowing non-accountability can only result in less than desirable results. fortunately like many things there is a formula and a better habit to adopt.